A New Monthly Spiritual Magazine / A Monthly Magazine Devoted to the Interests of Spiritualism. Corporate author: National Developing Circle1/1, January 1885-1/11-12, November-December 1885. $1.50 a year. 32-36 pp. 6x10. The final issue of 1885 announced the publisher's hope to continue the journal as a weekly journal, but nothing came of the idea. The connection of James A. Bliss with the magazine reveals it as a fraud. This was the organ of the National Developing Circle ("N.D.C.") begun by Bliss in 1884 to foster the development of mediumship under his instruction, especially through the use of his special "Blackfoot's Magnetized Paper" (Blackfoot being Bliss' spirit guide). The theory was that a Developing Medium, aided by the special paper, "simply acts as a 'magnetic centre,' and from him is sent to the different Circles the subtle psychological power so necessary for the development of Mediumship. When the lines of communication are once connected, distance has no perceptible effect upon these magnetic currents. And some one or more of those spirits having charge of this work visit every Circle held under this organization." Membership in the N.D.C. cost 50 cents a month (four sittings on Thursday evenings and four on Sunday afternoon). These fees were "a sacred trust" for the expenses of the N.D.C. only. The journal's aims were "1st. The presentation of the claims of Enlightened Mediumship. 2d. The consideration of all reforms that tend towards the elevation of humanity. 3d. To bind together into one brotherhood the disaffected factions in our ranks." To further these aims, the journal promised poetry, lectures, communications from ancient spirits (especially a history of "lost nations" like the "Tlaskans"), notes on the doings and records of local societies, especially meetings of Circles of the N.D.C., and accounts of physical manifestations and full-form materializations. The journal had contributions by J.M. Roberts (a long account of the early days of Bliss' mediumship and his discovery of magnetized paper), W.J. 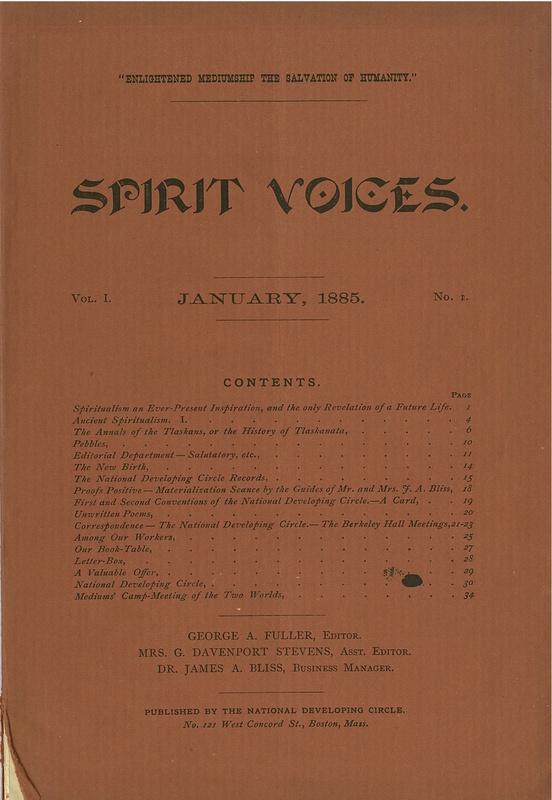 Colvillle, George A. Fuller, and other, local spiritualists, but gave special attention to reports of the success of the Circles and to letters from satisfied customers. It also devoted several pages to the Mediums' Camp-Meeting of the Two Worlds at Rindge, New Hampsire, complete with a plat map of parcels available to build cabins. This was a real-estate scheme hatched by Bliss and George T. Albro (a notorious medium and former manager of the spirit-painting Berry Sisters). Advertisements for Bliss' private services, Mrs. Bliss' full-form materialization seances, P.L.O.A. Keeler, V. Keeler (selling "magnetic pencils," magnetized in his cabinet by his Band), vital magnetic physicians, spirit photographers, and the like. Bliss had earlier tried to start the Quarterly Advance and Review (q.v. ), which fell afoul of the postal authorities who deemed it an advertising brochure. After the demise of Spirit Voices, he edited N.D.C. Axe and True Key Stone, and then The Sower for the National Developing Circle in Boston which had begun in 1884 as an adjunct of the First Spiritual Temple. Contributions by W.J. Colville. Full run, NSAC Lily Dale.